The ranks of digital nomads — people who use technology to work remotely and travel — are growing. 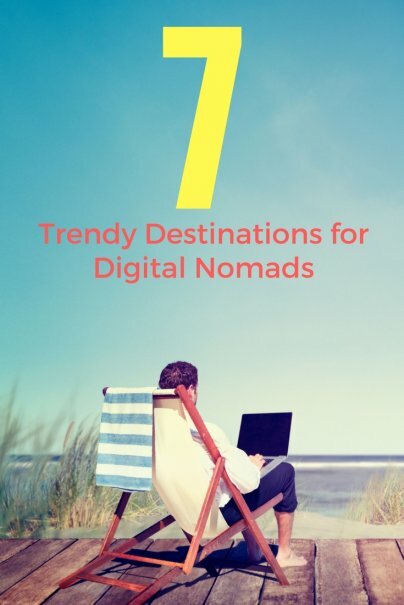 Every digital nomad has a different set of criteria when they are searching for their next destination. But high up on the list of requirements are usually low living costs, a strong community of like-minded people, and workable internet speeds. If you are on the lookout for somewhere to set up or continue your online activities, then look no further. These are the hottest digital nomad spots right now. Located in the north of Thailand, Chiang Mai is the smaller, laid-back older brother to the frenetic capital of Bangkok. Built around the remaining walls and moats of the old city, Chiang Mai has fostered a reputation as the digital nomad capital of South East Asia. It has an active community of digital nomads that use this city as a base for their business activities. The incredibly low cost of living in Chiang Mai is one of the main reasons so many people choose to set up here. Accommodation is readily available at low prices, with the average monthly rent for a furnished studio in a normal area coming in at just $197, and utility bills at around $32, according to Expatistan. Cambodia is a relatively recent addition to the South East Asia tourist trail, and its capital Phnom Penh is leading the way. There's a growing community of digital entrepreneurs taking advantage of its continuing evolution, which has seen it rapidly modernizing over the past couple of decades. Because of the huge amount of development that is still ongoing here, it's relatively easy to secure newly built and furnished apartments on modern blocks. Despite this, living costs in Phnom Penh are still low. Expatistan lists the average rent for a furnished studio apartment at $392 and utilities at $61. Colombia has grown massively in popularity over recent years as it continues its move away from its violent history. Now people are visiting for the untouched beaches, the vibrant culture, and the uber-modern cities that have quietly risen up throughout the country. No city has experienced a bigger transformation than Medellin, which has reinvented itself as one of South America's leading cities. Rental costs in Medellin are low considering how modern a city it is, with an apartment costing $297, but utilities for the month will set you back $132. Standards of accommodation can vary greatly, but it's possible to get quite a lot of bang for your buck depending on which area you settle in. Internet is generally reliable but slow throughout much of Colombia, with Medellin supposedly having the best services with speeds falling somewhere between five and 10 Mbps. Free Wi-Fi is widely available in cafes and bars and there are lots of high quality co-working spaces to choose from. Buenos Aires has a reputation as being the most "European" city in South America and is often referred to as the Paris of Latin America. This is largely thanks to its historic mix of Italian, Spanish, and German immigrants that helped shape the culture in so many ways, from the food to the architecture. Costs in Buenos Aires fluctuate a lot due to the unpredictable nature of the country's economy, but at present, rent will cost you about $476 and utilities will be around $86. Apartments here are generally quite large, as lots of them are in older buildings. Valparaiso is a laid-back, bohemian port city famed for its colorful buildings and the outstanding street art that's visible around every corner. The city has seen plenty of modernizing development in recent years, though it's still slightly ramshackle in appearance,. The majority of the housing is in historic old buildings. Monthly rental prices average out at $358 for a furnished studio, with utilities adding an extra $80. Thanks to the city being built high into the hills, most apartments come with stunning views. Internet speeds in Chile are some of the fastest you'll find in South America, clocking in at a zippy average speed of 15.3 Mbps. You shouldn't find any connection issues whatsoever here. Because one of the points on a remote worker's checklist is often cost, there aren't many cities in Europe that are hotbeds for digital nomads. But despite its burgeoning popularity, Bulgaria remains one of the cheapest destinations in that part of the world. Its capital Sofia is renowned for its young outlook and raucous night life, so it naturally attracts the "work hard, play hard" crowd. At $237 for monthly rent and just $54 for utilities per month, these are some of the cheapest living costs you will find anywhere in Europe. Being a former communist country, many of the apartment blocks aren't the prettiest to look at from the outside, but still have a good standard of decoration within. Internet here is reliable and fast, with download speeds averaging a smoking 60 Mbps. Wi-Fi is available in cafes and restaurants. There are free hot spots available all over the city as well, which you'll find in many parks, shopping malls, and train stations. Mexico, and particularly Mexico City, has something of a turbulent reputation, but it's worked hard to turn that around over recent years. Though it has a population of more than 21 million, it's cheap and easy to navigate, has a neighborhood to suit everyone, and an energetic, fun-loving vibe. Rental costs come in at around $496 per month plus $103 for utilities, but vary wildly depending on which area you choose within the city and how good your negotiating skills are in Spanish. Most accommodation here is a little bit old school, but has a certain charm about it. When it comes to telecoms, Mexico is pretty advanced and that extends to its internet speeds. At the top end, you can get up to an extremely rapid 50 Mbps high speed internet service. There are also dozens of excellent co-working spaces to choose from here, many with top notch facilities in great locations.